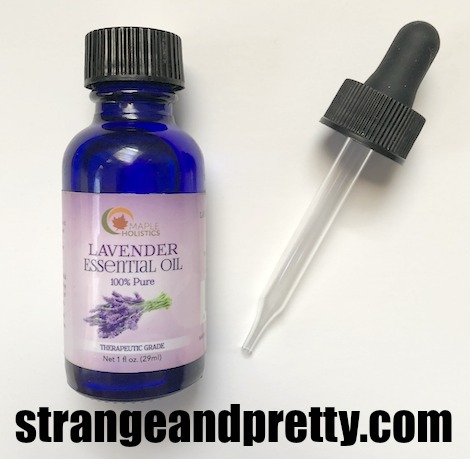 Strange And Pretty: Maple Holistics Lavender Oil. I love anything lavender. Scents, colors, patterns, all that. So when Maple Holistics reached out to me to try their Lavender Essential Oil, I was all for it. Maple Holistics Lavender Essential Oil is undiluted and as pure as it can get. Lavender oils homeopathic powers are legendary. It has been known to be an effective sleep aid while also providing relief form stress and anxiety. It makes the perfect addition to any massage and can be added to the laundry to give you clothes a wonderful scent. In addition it works well as a skin moisturizer and skin irritant soother. Discover what lavender oil can do for you! I was really interested in this product because I do suffer from anxiety, and it also effects my sleeping habits. Lavender is a well known stress reliever, and I've used this oil on my pillow, the back of my neck, and wrists right before bed. It helps calm me down. I also use it as an air freshener for the house. Since it is 100% lavender oil, the scent is a tad bit strong. You can easily dilute it with some water, or just make sure to use it sparingly. A little really does go a long way with this product. For me, my fear with this product was that if I used it on my skin, it would irritate me. My skin doesn't usually get on well with all natural products. However, I had no problems with this oil. I've used it on various parts of my body, and I've had no adverse effects, thankfully. I really like this oil. So much so that I'm almost running out of it. It's wonderful. I will certainly continue using it, as well as try other products from Maple Holistics, since it seems as though my skin gets along with their products pretty well. If you'd like to try out some products from Maple Holistics, they have a free samples program where you can receive products to try out and see if you like anything of their's. What types of oils would you recommend for different ailments?